Ram Ganesh is the second child of Phool Singh and Mausami from Nandapur village in Sheopur, Madhya Pradesh. He was born in the Primary Health Centre at Nandapur and belongs to the Sehariya community, a notified primitive tribe known for its extreme socio-economic backwardness. The family lives in a kachcha house devoid of basic facilities such as a toilet or electricity and depends upon the village tube-well for drinking water. Phool Singh is a daily wage labourer who often finds himself without work, forcing the family to go on empty stomach, sometimes days on end. 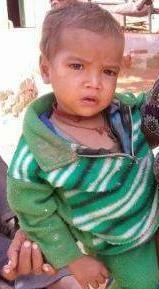 Sulochana Thapar Foundation’s HUNGaMA Next child nutrition project in Sheopur found Ram Ganesh when he was 11 months old. He weighed just 5.9 Kg. against an ideal weight of 7.6 Kg. for his age, and was immediately identified as severely underweight. The project team began weighing him regularly, at the same time providing counseling sessions for his parents on improving child nutrition. However, Phool Singh refused these services after two months, demanding financial support to his family instead. It took the project team four months to convince Phool Singh how important it was to monitor the child’s weight. By this time, Ram Ganesh’s weight had dropped further to 4.9 Kg. and he had become a Severe Acute Malnourished (SAM) child. The project team learned that Ram Ganesh was fed only roti without dal or vegetables. His parents also hadn’t initiated child care practices such as exclusive breastfeeding for the first six months and complementary feeding thereafter, due to lack of awareness and poverty. The project team therefore advised the family to admit Ram Ganesh in the Nutrition Rehabilitation Centre (NRC), some distance away in Sheopur town. It wasn’t an easy decision for the family. Admitting the child in NRC meant Phool Singh giving up his daily job, albeit temporarily, pushing the family even deeper into financial crisis. Even the promised incentive from NRC didn’t quite convince the family. After continuous follow-up however, finally they agreed and the child was shifted to NRC utilizing the free 108 ambulance service. Once admitted, Ram Ganesh was to stay in the NRC for two weeks; however Mausami took him back home mid-way through the treatment as she had no one at home taking care of her first child. Upon further requests and persuasion by the project team, the family at last agreed to keep the child in NRC for undergoing the prescribed two weeks’ treatment regimen. The care at NRC and weekly follow-up visits from the project team, together with counseling sessions for Mausami on child’s diet, frequency of feeding, hygiene etc. finally had the desired effect. The family noticed that Ram Ganesh was slowly but surely gaining weight, which was carefully monitored by the project team. After seven months of sustained intervention by the project, Ram Ganesh today is a healthy child, weighing appropriate for his age. He now weighs 8.7 Kg. Mausami has promised that she will continue to keep a watch on his weight and will never allow his nutrition grade to slip off again. Ram Ganesh is one of the many children in remote tribal areas of the country successfully brought back from Severe Acute Malnutrition by the HUNGaMA Next project of Sulochana Thapar Foundation that aims to fulfill its mantra of leaving no child behind.